In Works and Days, one of the two long poems that have come down to us from Hesiod, the poet writes of farming, morality, and what seems to be a very nasty quarrel with his brother Perses over their inheritance. In this book, Anthony T. Edwards extracts from the poem a picture of the social structure of Ascra, the hamlet in northern Greece where Hesiod lived, most likely during the seventh century b.c.e. 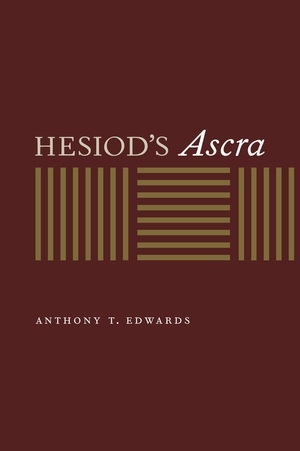 Drawing on the evidence of trade, food storage, reciprocity, and the agricultural regime as Hesiod describes them in Works and Days, Edwards reveals Ascra as an autonomous village, outside the control of a polis, less stratified and integrated internally than what we observe even in Homer. In light of this reading, theconflict between Hesiod and Perses emerges as a dispute about the inviolability of the community's external boundary and the degree of interobligation among those within the village. Hesiod's Ascra directly counters the accepted view of Works and Days, which has Hesiod describing a peasant society subordinated to the economic and political control of an outside elite. Through his deft analysis, Edwards suggests a new understanding of both Works and Days and the social and economic organization of Hesiod's time and place. Anthony T. Edwards is Professor in the Department of Literature at the University of California, San Diego. He is the author of Achilles in the Odyssey (1985).